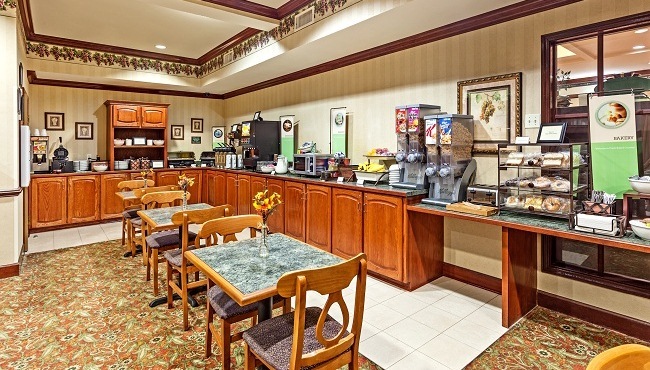 Before attending an event at Fort Stewart or starting a day trip to downtown Savannah or Tybee Island, fuel up with the free, hot breakfast, compliments of the Country Inn & Suites. Fill your plate with savory bacon, turkey sausage, grits and scrambled eggs, or opt for a sweet pastry or hot Belgian waffle. Pair it all with a cup of hot coffee, or indulge in a cappuccino. When you’re ready for lunch or dinner, you can find satisfying restaurant options within two miles of this hotel's location in Hinesville, Georgia, including Kobé Japanese Steakhouse and Chili's.